The Kivilcim Hotel is found in the city of Marmaris in Turkey. It is a great place for a family holiday and those who visit for business reasons will also have reason to smile. The hotel provides great facilities in a beautiful location so that all of the guests have an incredible time. The Kivilcim Hotel Turkey is in the holiday resort of Marmaris, just two kilometres to the north of the city centre, approximately 97 kilometres from the main Dalaman Airport and less than a kilometre from the beach. There are many local attractions. Top bars and clubs provide an excellent mix of culture and there are nearby shops and galleries that sell awesome products. 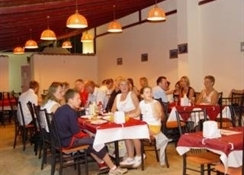 Eateries here serve the very best Turkish and international dishes. The hotel has its own onsite restaurant for 80 persons, which is traditionally Turkish but offers a buffet of various local specialities and international favourites.The swimming pool provides a perfect sun spot, surrounded by greenery and colourful flowers, and has a children's pool. 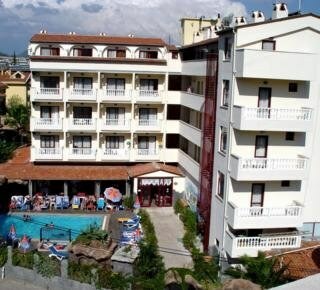 This intimate hotel has a friendly atmosphere and offers a bar and Turkish shows and dancing. This small and friendly hotel offers a high level of service and good facilities.The town of Marmaris is located between the Aegean and Mediterranean seas, on the world's largest natural harbour, surrounded by pine-clad hills.Totally 40 rooms (including 8 family rooms) and 120 beds.The pretty guestrooms are equipped with TV, air conditioning (charged locally), Shower & WC, Hair Dryer, safe (charged locally) and have a balcony with views of the surrounding gardens and either the sea or pool. Situated in southwest Turkey, in the province of Mugla, Marmaris is one of Turkey's biggest tourist resorts. To the north lies the Gulf of Gokova, to the south the Mediterranean. On the west is Datca peninsula and to the east Koycegiz lake. The hills running in to the sea and the beautiful bays make Marmaris very special.Kivilcim Hotel is 90 km from Dalaman International Airport, 2 km from the city centre, 100 m from the sea and located at the main road.